* single entry with 30 days maximum duration. PhP3,612 in cash payment payment through UCPB (2 weeks processing). 1. 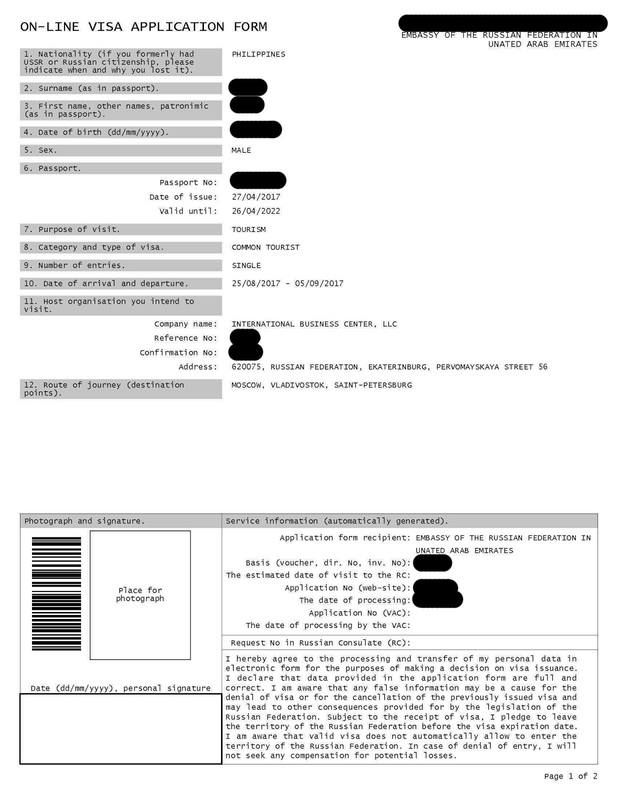 Visa application form (one per person) available at visa.kdmid.ru (fill in the form online and printed). Please read attentively the information on the website before you fill in the application form. 2. A valid passport, which should have at least one page clear from both sides intended for visas. 4. 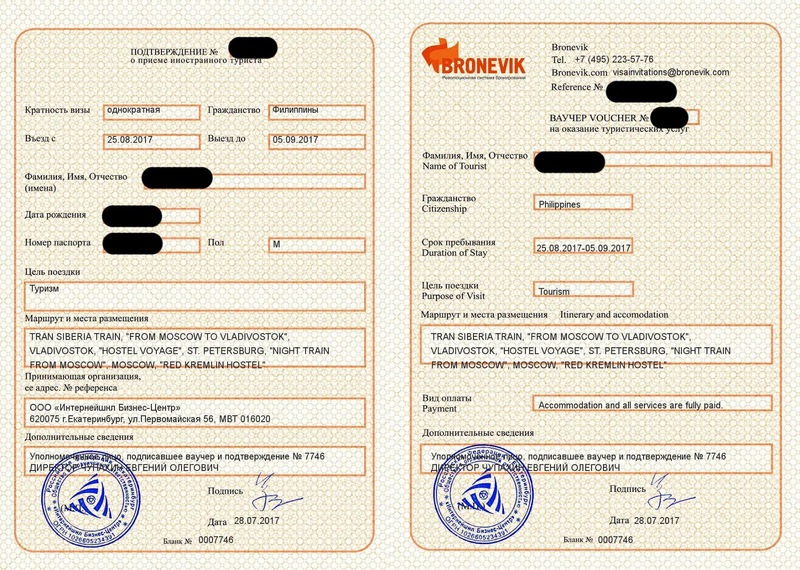 Travel confirmation from a hosting authorized Russian travel agency, accredited by the Russian Ministry of Foreign Affairs and a copy of a travel voucher from the same travel agency in Russia (per application). Fax and e-mail copies are acceptable. 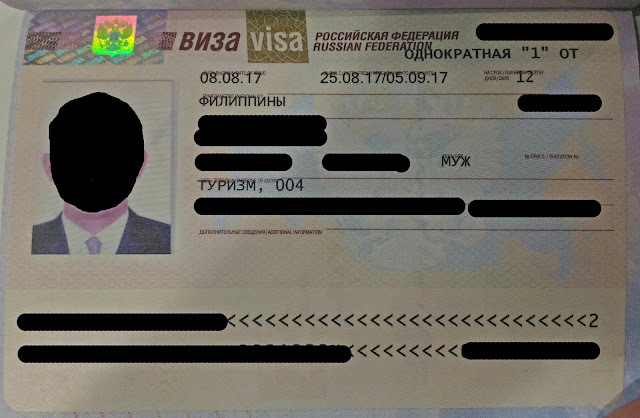 The confirmation must contain: the agency's reference number, registration number, the date of entry to Russia and the date of exit from Russia, the purpose of the trip, the number of entries to Russia (single or double entry). 5. Tickets. The dates should be the same as in the confirmation and application form. 1. 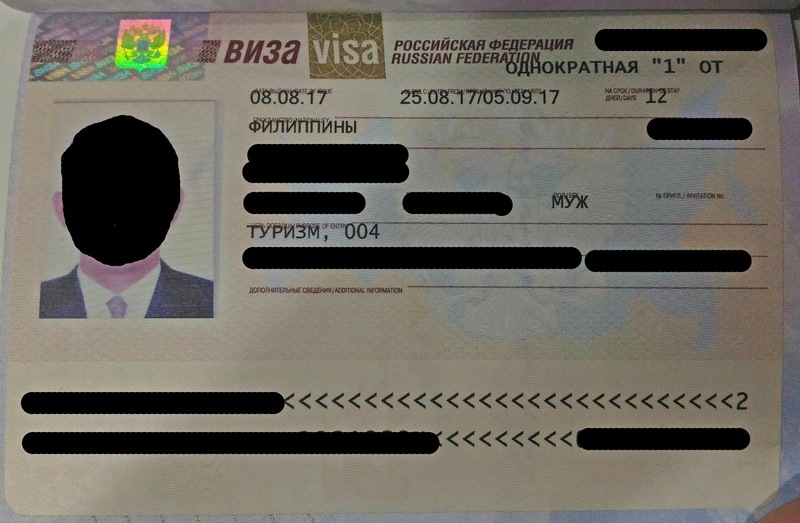 Application available online at http://visa.kdmid.ru (must be printed and brought to the Embassy). All questions in the application form should be answered. If a question is not applicable to the applicant, he should put "N/A". Each application form must be signed by the visa applicant personally. Incomplete visa application forms shall not be processed. 2. Valid national passport (original only and it should have at least two clear visa pages). It must be valid not less than six months after the visa expiration date. 3. 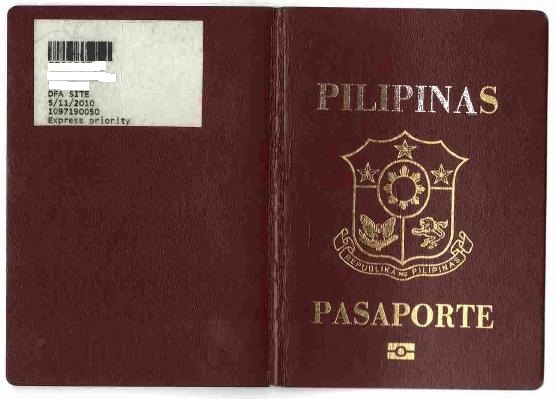 One picture of an applicant (passport size). 4. Copies of the passport and residence visa. "Trans-Siberian is not just a railway, it’s an experience, a condensed version of life in somewhat extreme but comfortable and even amazing setting. That’s why TransSib is something people want to do at least once in their life: it’s comparable to climbing a mountain or going to a meditation retreat. Except that in the case of Trans-Siberian railway the adventure is aided by infrastructure, it also has several degrees of comfort (a brief hello from capitalism), and is not a solitary but a truly collective experience – a very 21-st century way of engaging into a spiritual quest." July 28, 2017 (Fri) -applied online my travel voucher for only $33 (1,900 RUB / 122.45 AED) and my medical travel insurance for only $14 (835 RUB / 73.85 AED). Total of 196.3 AED. Both documents of travel voucher and medical travel insurance were received 10 mins after payment confirmation. After this, I filled-up my application form together with the appointment schedule. August 01, 2017 (Tue) - I visited the Russia Embassy in Abu Dhabi on my appointment schedule around 40mins earlier. Upon entering the embassy, I went to stub corner and waited less than 5 mins for my turn. To strengthen my application, I submitted also confirm flight tickets, accommodation and salary certificate. Within 5mins the embassy staff handed-over a NBAD deposit slip where I need to deposit my payment for single entry visa regular processing for 340 AED. I went immediately to NBAD main branch near Al Danah Park and ran as fast as I can before the embassy closing time at 2000H. I handed-over the deposit receipt then after less than 5 mins the staff gave a claim stub scheduled on next Tue, 8th-Aug.
August 08, 2017 (Tue) - I went back to Russia Embassy to claim my passport on the same time I submitted. Claimed my passport with tourist visa single entry. Spassiba Rusiya! Booking Buddy is the #1 travel search website, which you can use to compare travel deals from the large travel booking sites. How long is the validity of the visa? I am traveling first week of april. April 9 to 15. I plan to apply this January. validity of the visa is exactly the duration of your travel dates. In your case, your tourist visa validity should be April 9 to 15. May I know what "Which institution you are going to visit?" in the application form mean? I'm not joining any group tour and plan to do DIY. Thanks! item #11 of image #5 above please (filled-up application form). Hi, how did you get your travel confirmation and travel voucher? Does it really have to be from a travel agency in Russia? Does it mean that we cannot do our trip on our own and must book a tour for our trip with an accredited travel agency? You can get those on the links on DATELINE OF MY APPLIED RUSSIA TOURIST VISA at the bottom of this post. No, it can be from hotel where are you staying. No, I did my travel on self-guided solo basis, all by myself itinerary, everything on my own even the Trans-Siberia trip I was the one who personally planned for it.